Here we are again at the start of the “Gesima” season with Septuagesima Sunday, the ninth Sunday before Easter, 64 (and not 70) days before Easter. In the Podcast Homily I posted today you will find a brief discussion of the origin of the “Gesima” naming system, plus a homily for Septuagesima Sunday. The Scripture references are 1 Corinthians 9:24-27 and Matthew 20:1-16, the Parable of the Laborers. I discuss the symbolism of the characters from the perspective of St. Paul and many of the writers of the early Christian Church. Listen to the MP3 version. You Tube has given the AIC a new, direct and unique URL address: www.YouTube.com/c/SaintJohnC. That will take you directly to the host page showing all the videos, listed in reverse order with the most recent first. They also gave me a unique new URL address for my Google+ profile page: www.Google.com/+SaintJohnC. If you join my Google circle, they will notify you of all new postings. This week it happens that the subject of The New Testament: Episode 36 in our AIC Bible Study series and the Gospel text for Third Sunday After Epiphany is the same text from John 2:1-11, the account of the first of seven “signs”, being the Wedding at Cana. Episode 36 is illustrated with several stained glass windows, including a Mayer of Munich window at St. Joseph’s Villa Chapel, Richmond, VA. Watch Episode 36 on our You Tube channel. I also posted a Podcast Homily version which is linked from the page of the same name at the AIC web site. Listen to the Podcast Homily version. There is also a Podcast version of the sound track for the video, which includes the theme music for the series. Listen to the sound track only. 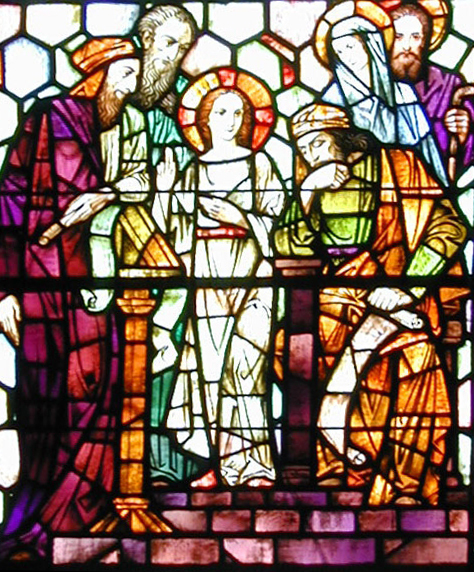 The Mayer of Munich window shows Jesus, with the Blessed Virgin Mary looking on, at left background, instructing the servants to fill the jugs with water. For reasons of space, the Mayer artists included only three jugs rather than the six described by St. John. The current series of Bible Study videos is exploring the seven signs. In Episode 37, which will be posted midweek during the week of January 26th, I will focus on the Healing of the Nobleman’s Son, the Lame Man and take up Part 1 of 2 on the healing of the Blind Man. Paintings on Light can be ordered from my author page at Amazon in a paperback edition which includes pictures and narratve on all the stained glass windows in the Chapel, plus a brief history of the Chapel and the firm of Franz Mayer of Munich, Inc. I have not been able to complete the DVD Companion for the book, owing to technical issues, which I hope will be resolved soon. Window No. 5, the Baptism of Christ, Franz Mayer of Munich, at St. Joseph’s Villa Chapel, Richmond, VA, 1931 A.D. In doing the research for the Christmas series, Reflections on the Twelve Days of Christmas, I came across another illustration of John the Baptist in the form of a mosaic at Jerusalem. 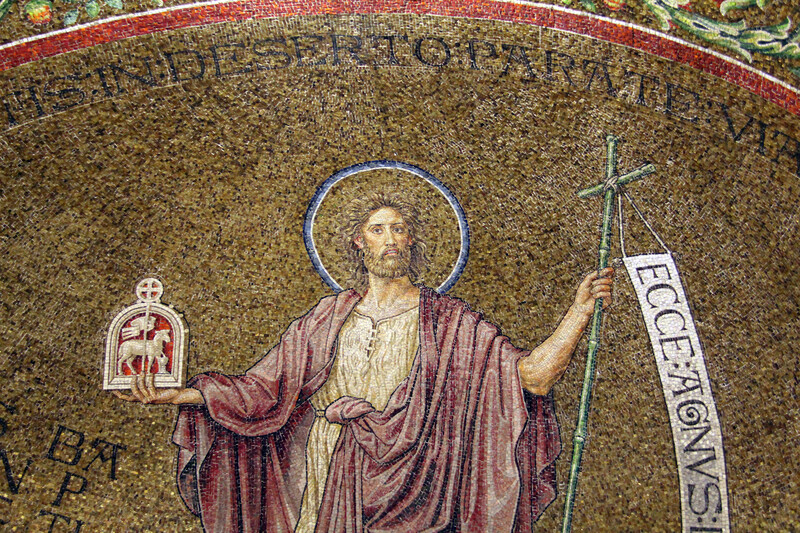 John the Baptist is depicted in mosaic form at the Cathedral of the Assumption on Mt. Zion, the highest point in Jerusalem. The Cathedral is also called the Cathedral of the Dormition, which means falling asleep, in the Eastern Orthodox tradition. The church was built in the late 19th C. on a site where a previous building existed in the 6th or 7th Century. For the First Sunday After Epiphany the Book of Common Prayer’s Gospel reading is St. Luke’s childhood glimpse of Jesus at age 12, usually called “teaching the Doctors in the Temple.” I’ve posted a 12-minute Podcast Homily on the Podcast Homilies page at our Web Site, part of a series of homilies for Epiphany season. 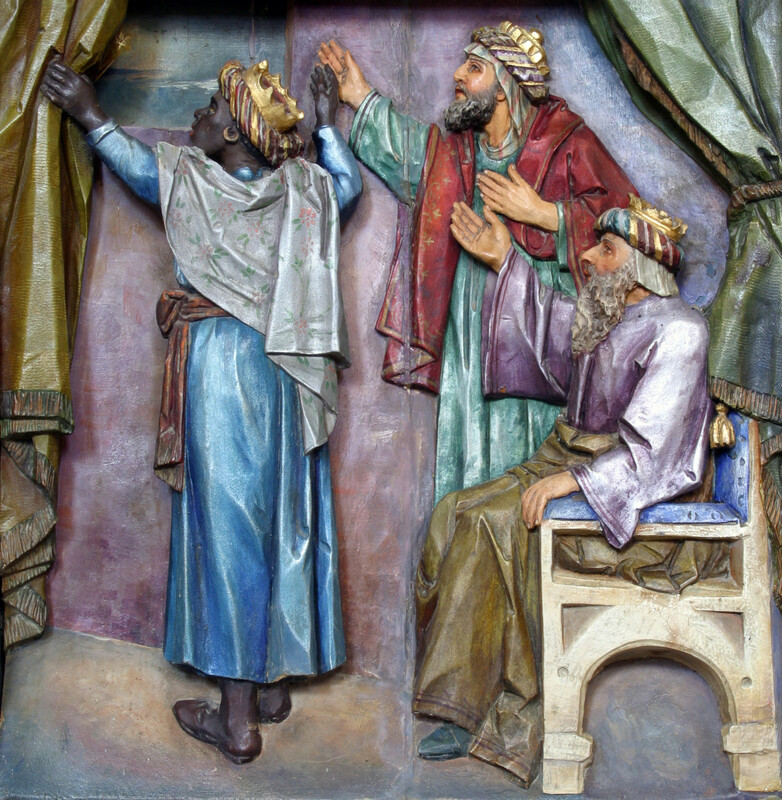 Teaching the Doctors in the Temple; Window No. 32, St. Joseph’s Villa Chapel, Richmond, VA, by Franz Mayer of Munich, 1931 A.D. This event has been depicted many times, but my favorites are two stained glass windows, both in the Munich Style. The first of these is at St. Joseph’s Villa Chapel, Richmond, VA, where my former parish, St. John Chrysostom Anglican, worshiped. The window was designed by Franz Mayer of Munich. It shows Jesus at the center of the image with the several “doctors,” meaning the wisest men among the Temple leadership, looking on. St. Mary and St. Joseph are the background figures. The window was installed in 1931 A.D. as part of a set of 46 windows. 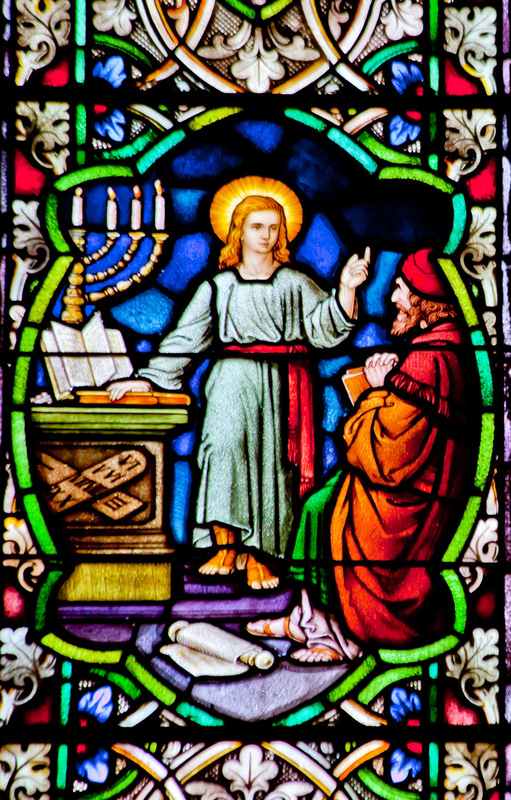 Teaching the Doctors in the Temple is one of ten Life of Christ windows in the upper wall of the Nave. All the windows in the Chapel are shown in the AIC Bookstore publication, Paintings on Light: the Stained Glass Windows of St. Joseph’s Villa Chapel. The second window is also in the Munich Style and might have been a Mayer design or one by the associated firm of F. X. Zettler, founded by Mayer’s son-in-law. It is one of a pair of windows depicting scenes in the childhood of Jesus Christ. The other half of the scene is St. Joseph holding the baby Jesus. This window is at the National Shrine of St. Francis Assisi in San Francisco. A smaller window than the one at St. Joseph’s Villa Chapel, there was room for only one “Doctor.” Note that the face of the column to the left of the 12-Year old Jesus bears an image representing the Commandmants. The location of the scene is indicated by the lighted Menorah and the scroll at Jesus’ feet. The source from which I purchased the picture did not identify the designer or show information about the windows. The twining bands of colored glass and the use of leaves with finely-detailed vine tracery are suggestive of the work of Franz Mayer. Listen to the Podcast Homily.